After a near windless summer I was really excited one day in late September that was particularily windy to finally get my kite and camera up and flying at Spanish Banks. Short story is it was too windy and I lost my kite (string broke). I did get some rather interesting pictures though, but nothing useful for mapping. 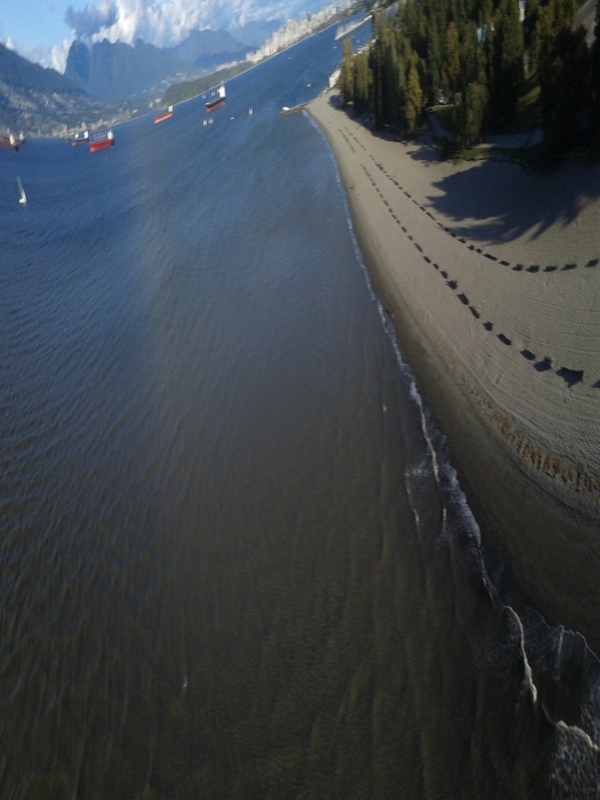 Attaching a camera without a stabalizing housing thingy results in crazy but awesome looking images. My kite was lost at sea, never to be seen again (despite my rescue attempts). Yesterday, inspired after returning from the 2014 Barnraising, I decided to try my homemade kite that has yet to sucessfully fly (thanks to a no-wind summer). This time I opted to build my camera a houding made from some cardboard and a plastic plant pot. The kite flew fantastically in (5-20 km/h wind), however the photo app, Tina Time Lapse glitched and didnt record anything. Maybe I need to test out a new timelapse photo app. Has anyone else had problems with the Tina Timelapse app? Are there other Android apps that are better? sorry to hear about that first kite loss!